Happy New Year!! I would embellish and say that I had an amazing celebration and really partied it up but that would be a lie. 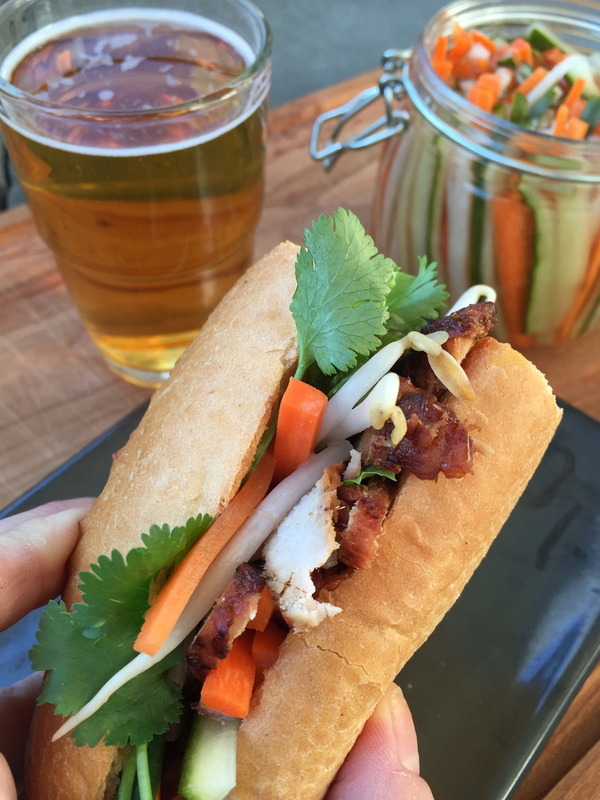 This new year’s eve, husband and I had a quiet night in, hung out with our little dude, put on comfy clothes, watched a bit of tv, drank some brewskies and made some home made Lemongrass Banh Mi Sandwiches. The Banh Mi is the perfect sandwich and packs a massive punch. If you are a sandwich lover, the Banh Mi is probably in your top 3 Sandwiches of all time…well it’s definitely in my top 3. I started working on this bad boy a few days ago and getting prepared for a flavour packed sammie of champs. A bit of a confession here, I thought we were having some friends over for beers and eats on the 30th but totally messed up the months…yup, they were actually trying to schedule something for January 30th. So I had already started making vietnamese pickled veggies and marinading the meat when I realized that they weren’t coming for a month. DOH!! Epic Fail. Well, actually no because then it dawned on me that I now have nothing to prep or do for New Years eve, Husband and I can go mental on some tasty vietnamese subs!! Oh yeah, I think the fail actually turned in to a win!! 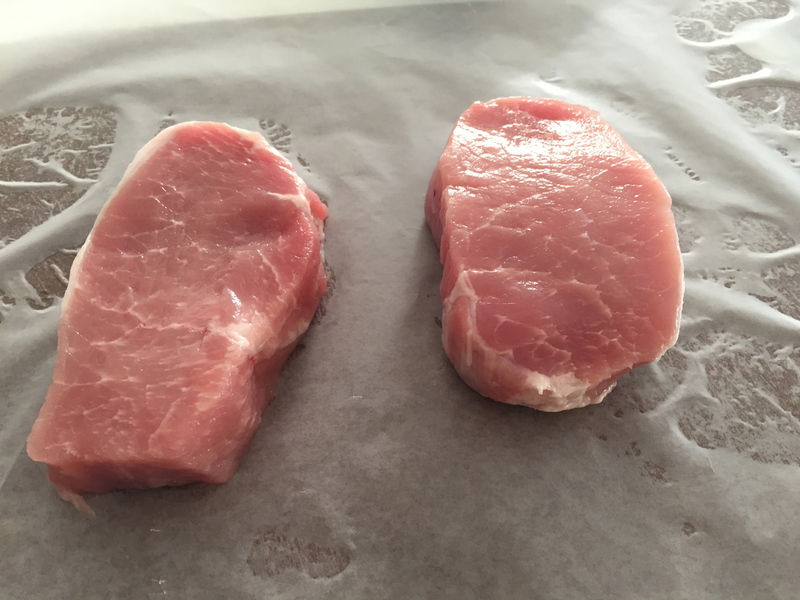 The other winner here is that the pork gets to marinade for an extra day…now that is something to celebrate!! 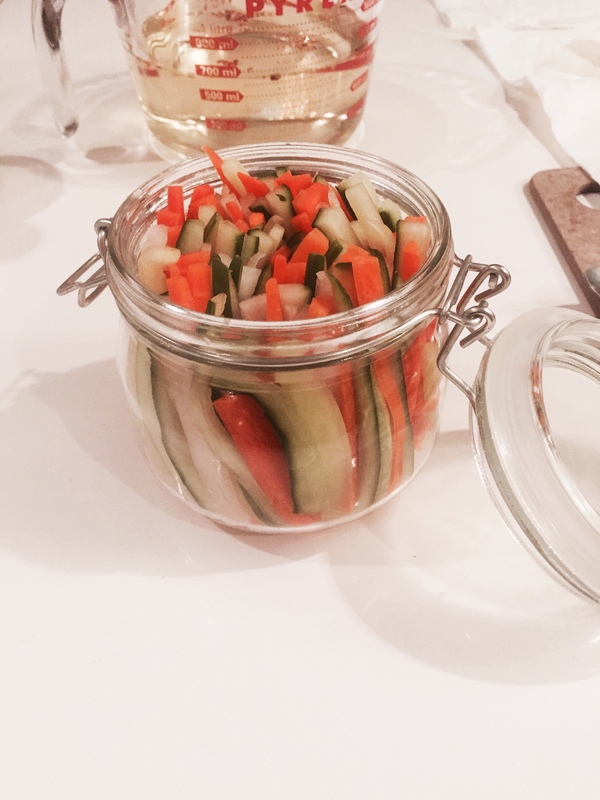 You probably saw on my earlier post that I made some very simple vietnamese quick pickled veggies, these are to accompany the Banh Mi sammies. You really cannot have a Banh Mi without these sweet and sour crunch babies. They liven things up!! 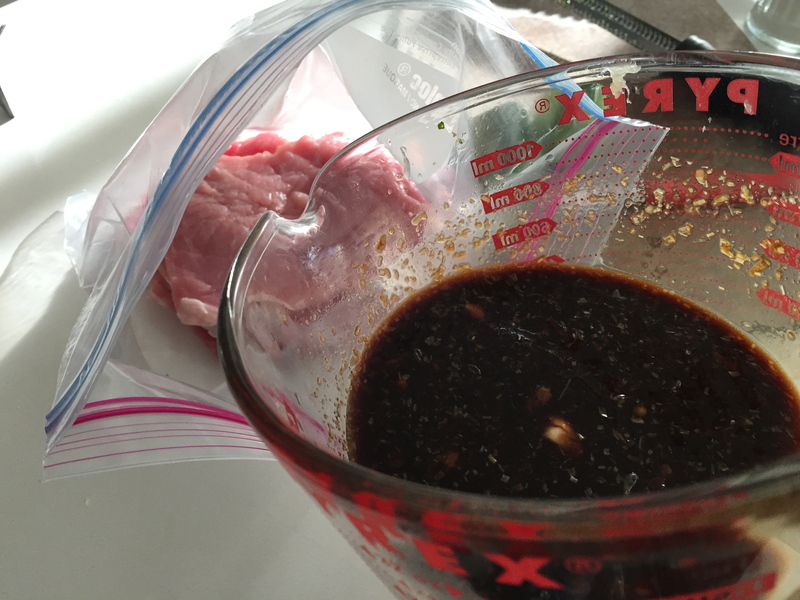 I don’t profess that this is in anyway a traditional vietnamese marinade for meat but it’s the flavours I like and I think my version always seems to work well and taste great. 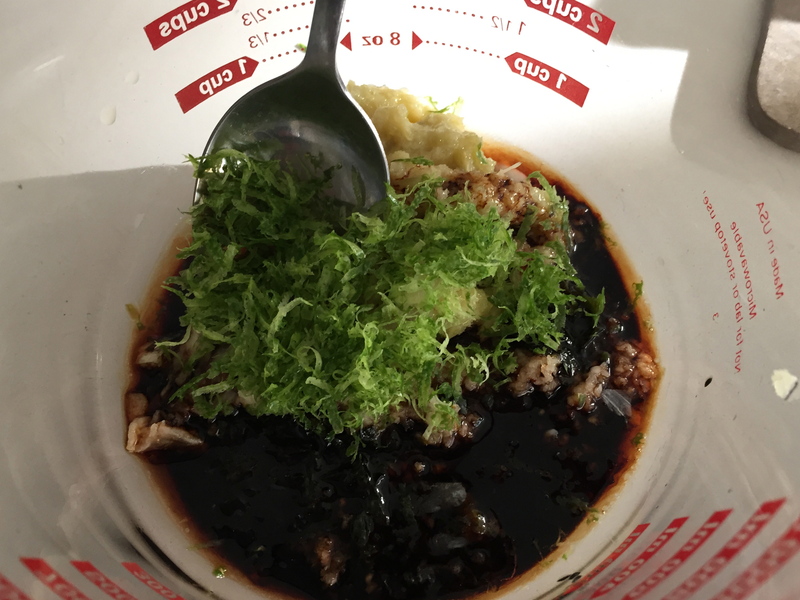 For the marinade I used Lemon Grass, Fish Sauce, Garlic Cloves, Soy Sauce, Lime (Juice and Rind), Sugar, Sriracha and water. Stir that up in a large glass measuring cup or bowl and let it sit while you get ready to pound the living crap out of your meat. Next you are going to need a mallot. Why? Because you are going to beat the crap out of your meat, releasing all negative feelings about 2014 and when you are done, you will be entering 2015 with a bang and will be ready to conquer the world. Trust me!! 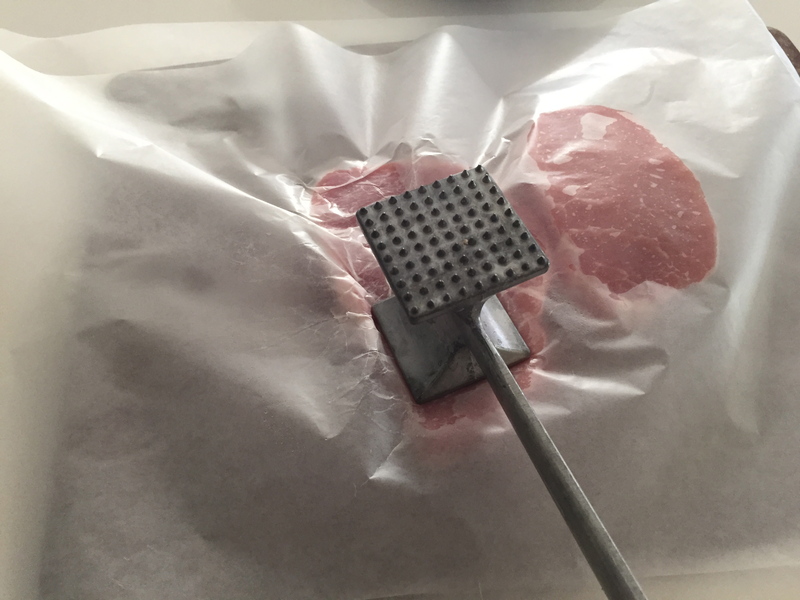 I took some pork loin, placed it in between some wax paper on a cutting board and hammered away. The goal here is the think your meat out a bit so it’s not to thick. This will allow it to soak up the marinade and grill up great!! Next, place your meat in a large zip loc bag and then pour your marinade in. Seal it and squish it all around, making sure that all of your meat gets coated. Place it in your fridge at least 3 hours to over night (overnight minimum will give you better results but I get it, we don’t all have that kind of time). If you leave it for 2 days it will be even more flavourful!! I am a huge fan of marinading!! Sometimes I make up marinades and throw in my meat or veg in a zip loc and get ready for the week. This way you have super flavourful stuff all ready to go when you need it. Planning can pay off for a quick week night dinner. Now it’s grillin’ time!! OH yeah!! 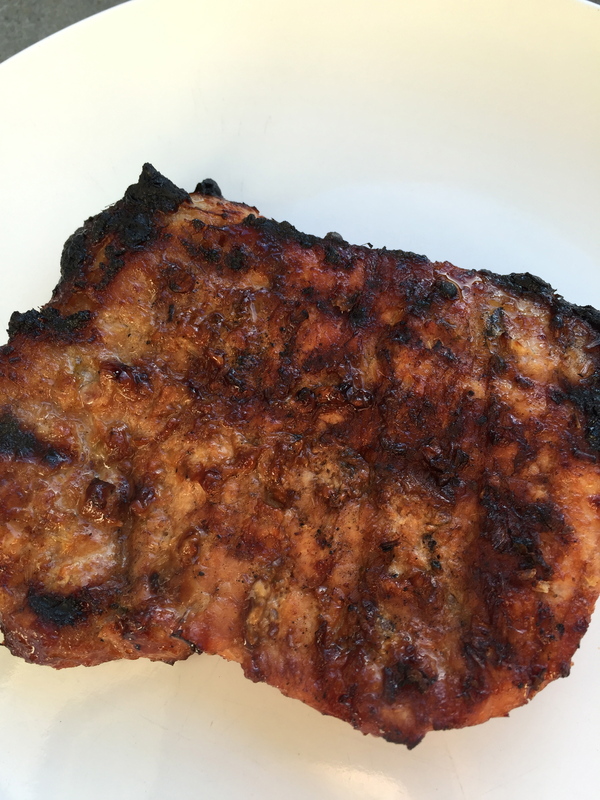 I fired up the grill and grilled up the pork on each side for a few minutes or until it has a beautiful caramelization on it. 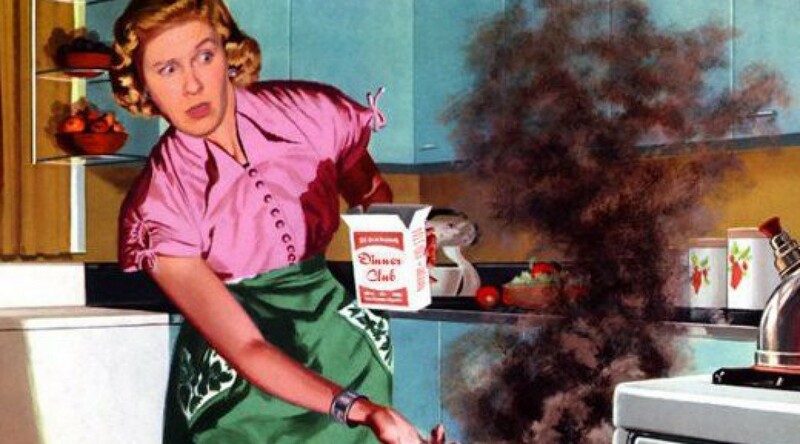 While you are letting that bad boy grill up nice, go ahead and get a few fixin’s ready. 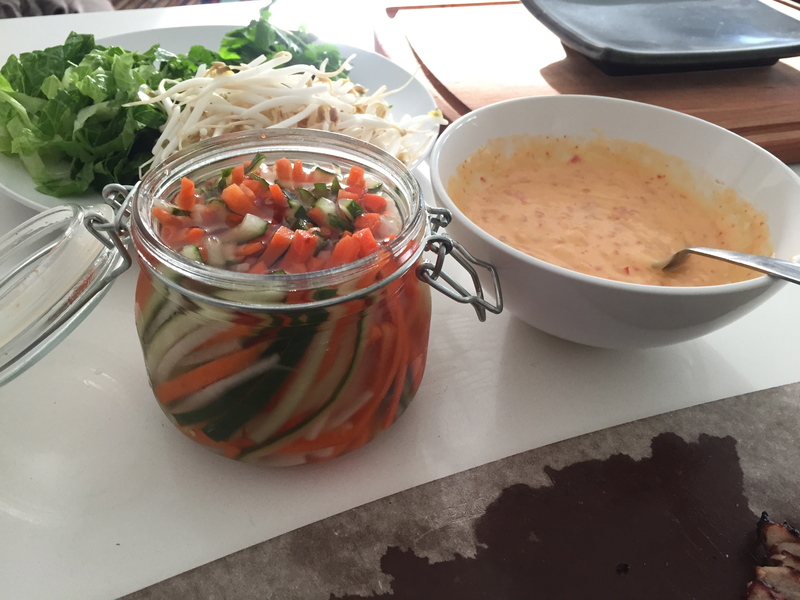 I like to use a few bean sprouts, cilantro leaves, lettuce and a bit of mayo. 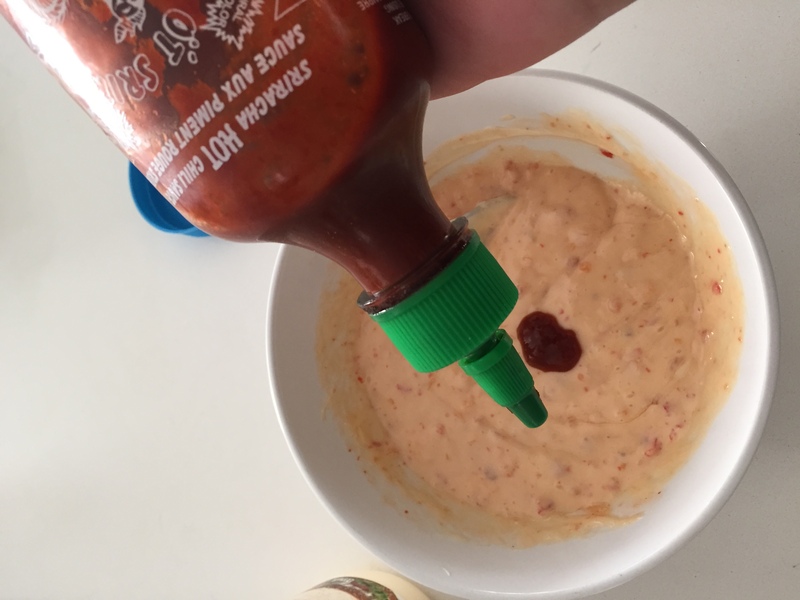 I actually flavoured this mayo with a bit of sweet chilli sauce and sriracha. Sweet with heat!! Now the meat is ready! Take it off the grill, let it rest and then slice it in to thin strips. Get ready to assemble the tastiest sandwich in the history of all sandwiches. Banh Mi is all about the bread. Unfortunately I still can’t seem to find good sub buns for it so I will normally buy a white baguette , slice it in portions and i’m good to go!! You can lightly toast it and it will be amazing!! First thing you want to do is put a dollop of the mayo on the bread, then meat, then your pickled veg, cilantro (if you like it) and lettuce…then top it off with the other side of the bun. 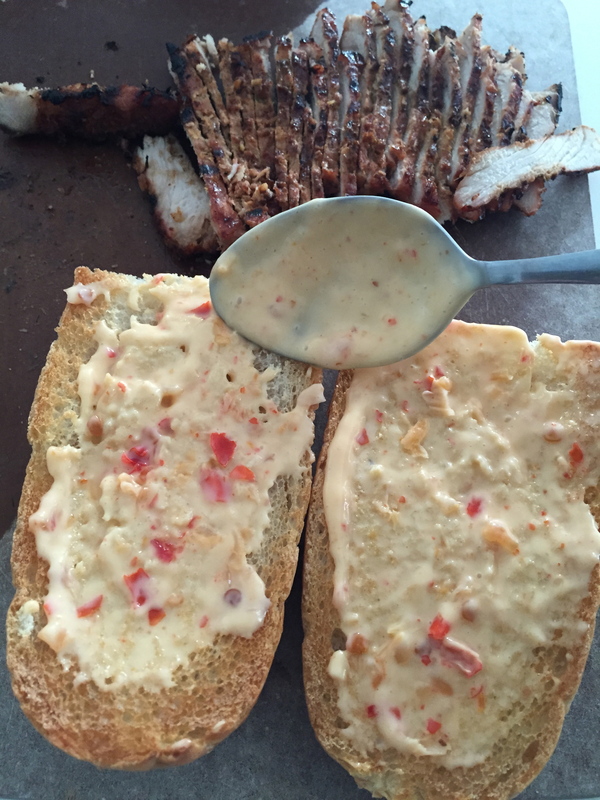 Pour yourself a nice cold lager and you are ready to celebrate an amazing sandwich and a new year!! 2 Stalks of Lemongrass Chopped fine. *If you can’t find fresh lemongrass, just use that stuff in the tube. Gasp Shock…don’t worry, it will still taste the same. You gotta do what you gotta do!! 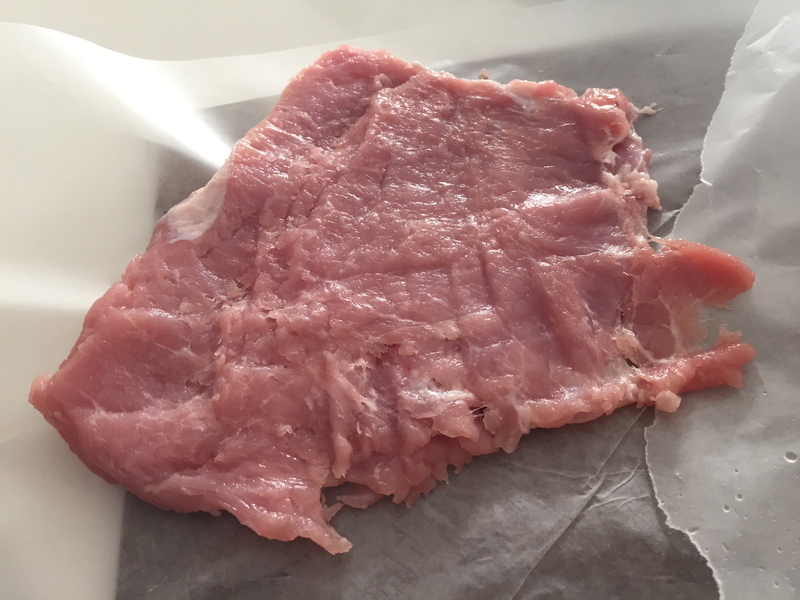 Place meat (can be used with Pork, Beef, Chicken or even Tofu) in a zip loc bag and pour marinade over top, squish around to cover the meat and then seal and place in your fridge overnight for best flavour. 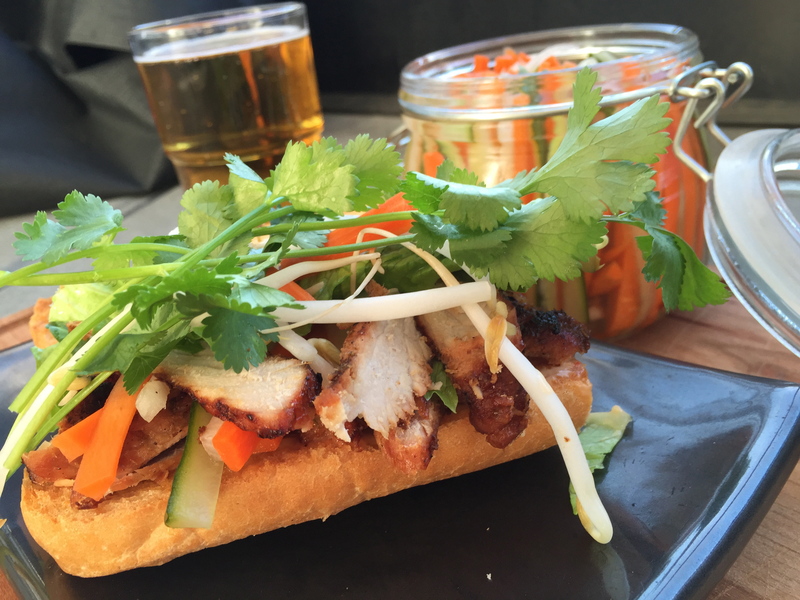 I hope you fine people enjoy this marinade and experiment with making your own Banh Mi Sandwiches. These sammies are the perfect thing to make with a crowd because you can do everything in advance and then all you have to do is grill up your meat and assemble. The other great thing about this is if you marinade a fair amount of meat, you can grill it up and then use the rest for an amazing Vietnamese Rice Noodle Bowl and no one in your house will be complaining…trust me! !